What is red sage root? What is it used for? Red sage root is one of the most popular components of Chinese herbal medicine. It is a member if the labitiae family. Native to the Mediterranean region, it is now cultivated throughout Japan and China. It grows to a height of 60 centimeters, with rough, oval-shaped leaves and different colored flowers, depending on the variety. While red sage leaves are used (either fresh or dry) as a flavoring in many foods, particularly sausage and poultry, the rhizome and root are used medicinally. The root is harvested in autumn and early winter, washed clean, and dried in the sun to be used either raw or after being fried with wine. In traditional Chinese medicine, red sage root is considered bitter in flavor and slightly cold in nature, and is related to the Heart and Liver meridians. It promotes blood circulation, which helps treat irregular menstruation, dysmenorrhea and amenorrhea; removes heat from the blood (to relieve inflammation); and tranquilizes the mind. It is often used in combination with other herbs, such as peony, Chinese angelica, sandalwood and turmeric to enhance its qualities. How much red sage root should I take? 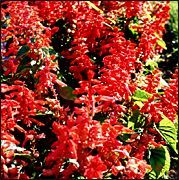 The standard dosage of red sage root to be used depends on the condition being treated. Generally, the dosage of red sage root varies between 5 and 15 grams per day, decocted for oral intake. It should be used after being fried with wine to promote blood circulation. What forms of red sage root are available? Red sage root is available either whole (either raw or fried) or as a powder. What can happen if I take too much red sage root? Are there any interactions I should be aware of? What precautions should I take? Red sage root counteracts the effects of black false hellebore root, so it should not be taken in conjunction with this herb. Because it can dilate some blood vessels and resist coagulation, patients taking blood thinning medications should consult with a health care provider before taking red sage root. As always, make sure to consult with a qualified health care provider before taking red sage root or any other herbal remedy or dietary supplement. Budavari S (ed.) The Merck Index: An Encyclopedia of Chemicals, Drugs and Biologicals, 12th edition. Whitehouse Station, NJ: Merck and Co., Inc., 1996. Dong JC, Xu LN. Beneficial effects of acetylsalvianolic acid A on focal cerebral ischemic rats subjected to middle cerebral artery thrombosis. Yao Hsueh Hsueh Pao 1996;56:6-9. Gruenwald J, Brendler T, Jaenicke C (eds.) PDR for Herbal Medicines, second edition. Montvale, NJ: Medical Economics Company, 2000, pp. 636-639. Newall CA, Anderson LA, Phillipson JD. Herbal Medicines: A Guide for Health-Care Professionals. London: The Pharmaceutical Press, 1996. Wu YJ, Hong CY, Lin SJ, et al. Experimental study of salvia miltiorrhiza on prevention of restenosis after angioplasty. Chung Kuo Chung His I Chieh Ho Tsa Chih Aug 1996;18:480-482.